An international team of US and Mexican scientists has completed a successful Very Long Baseline Interferometry (VLBI) test between the Large Millimeter Telescope Alfonso Serrano (LMT) and several Very Long Baseline Array (VLBA) stations. An international team of US and Mexican scientists has completed a successful Very Long Baseline Interferometry (VLBI) test between the Large Millimeter Telescope Alfonso Serrano (LMT) and several Very Long Baseline Array (VLBA) stations (Figure 1). 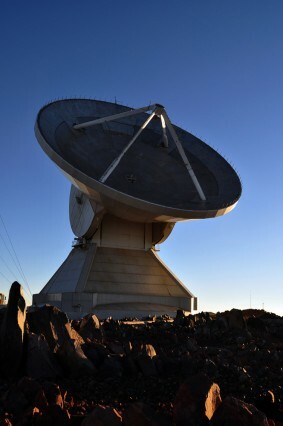 The LMT is a 50m diameter millimeter-wave telescope at the summit of Volcan Sierra Negra at an elevation of 4600m. Because of its high elevation and geographical location, the LMT promises to be a scientifically important addition to the VLBA at 3mm and to the Event Horizon Telescope (EHT) project at 1.3mm. As a first step toward full LMT participation in these networks, the team assembled a full VLBI system at the LMT, consisting of an IF downconverter – to process the IF from the facility 3mm Red Shift Search Receiver – a VLBI Digital Backend, and a Mark5b VLBI recorder. Because a hydrogen maser could not be installed for this test, a precision quartz oscillator, which has stability comparable to a hydrogen maser on integration times shorter than 10 seconds, was used as the fundamental VLBI frequency reference. Fig. 1: A map of the relative locations of the antennas involved in the successful Very Long Baseline Interferometry (VLBI) test between the Large Millimeter Telescope (LMT) and several Very Long Baseline Array (VLBA) stations. 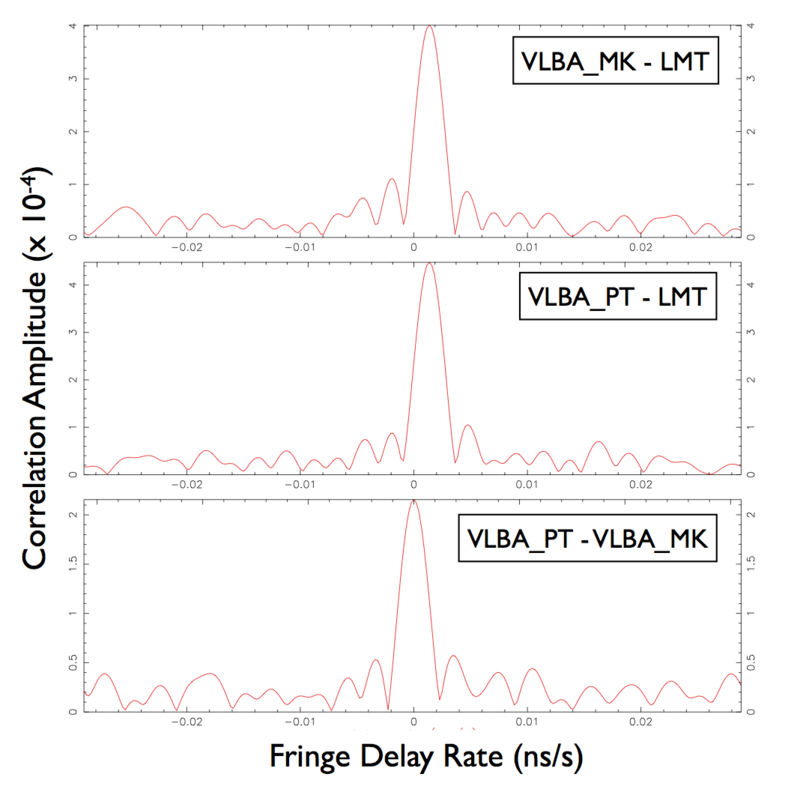 Robust and clear VLBI fringe detections were obtained on 26 June between the LMT and VLBA sites at Mauna Kea and Pie Town (Figure 2). 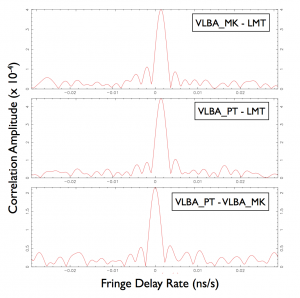 These detections confirm that the LMT facility 3mm receiver has phase stability characteristics suitable for VLBI, and that the LMT can deliver significant added sensitivity to the VLBA. These successful tests pave the way for high sensitivity VLBI projects at 3mm wavelength that will target, among other objects, AGN and astronomical masers. At 1.3mm wavelength, in conjunction with the EHT, the LMT will add important capability to efforts aimed at resolving and imaging the black hole event horizons of SgrA* and M87. Fig. 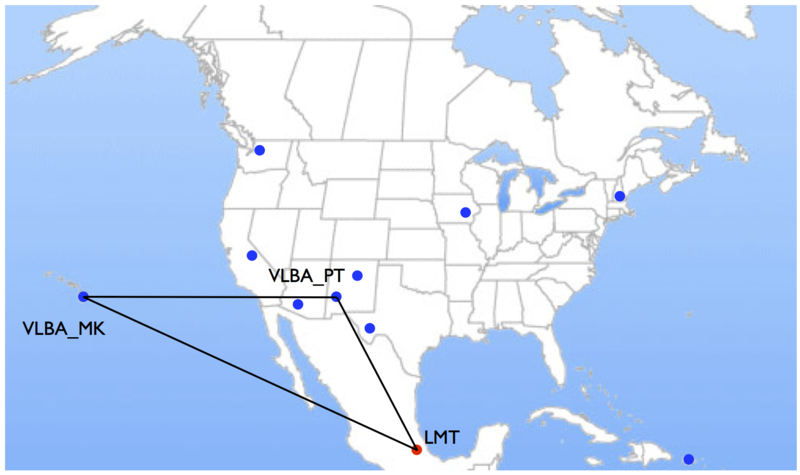 2: VLBI fringe detections obtained 26 June between the LMT in Mexico and VLBA sites in the US at Mauna Kea, Hawaii (MK) and Pie Town, New Mexico (PT). Building on these tests, the team is now making plans for permanent installation of a hydrogen maser and instruments that will allow the LMT to participate fully in Global VLBI observations. Institutes involved in the test include: MIT Haystack Observatory, University of Massachusetts, NRAO, the Instituto Nacional de Astrofîsica Óptica y Electrónica, and the Smithsonian Astrophysical Observatory.